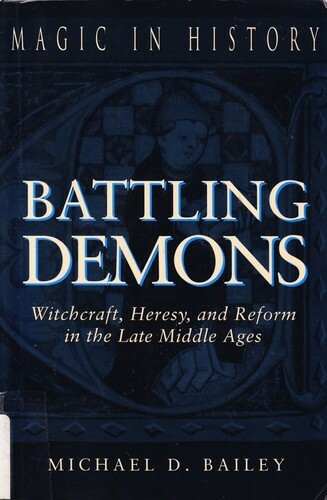 Bailey, Michael D. Battling Demons: Witchcraft, Heresy, and Reform in the Late Middle Ages. University Park, Pennsylvania: The Pennsylvania State University Press, 2003. The focus of Battling Demons is Johannes Nider (d. 1438), a Dominican theologian. Bailey focuses on the connections with heretical movements and increase persecution of witches. He asserts that witchcraft, as it became known as a concept in the late Middle Ages, had a place in the growing turmoil and crisis within the religious communities (between the time of the Great Schism of 1378 and Luther’s break with Rome of 1521). He states that “witchcraft was not an isolated concern of Nider’s: his particular interest in witches and their malevolent activates was closely related to his other religious concerns” (140). The witch craze was not an isolated event but part of a larger response to what seemed like the growing threat to the Western Christendom. To Bailey, persecuting witches had little to do with those remnants of European Pagan culture. It was a response to what seem to be the increase demonic forces at work. To oversimplifying it, people of the Middle Ages thought that there must be witches because of the religion turmoil in which the Devil must be working again Western Christendom. It was this idea of crisis that would lead to the narrow definition of a witch, which did not come into focus until 1430’s being fully stereotyped with the 1487 Malleus maleficarum (30). Bailey follows the origins of witchcraft in clerical thought along with showing Nider’s influence by popular accounts. Much of Bailey material is taken from Nider’s Fomicarius. Bailey discusses such topics as inventing the Sabbath, women as witches, heresy, and reform. Bailey uses the specific example of Nider’s writing to illustrate he overall view of the development of the concept of the witch. I feel this is a good use of Nider’s work and helps us understand one part of the devolvement of concept of witchcraft. I do not see his book as meaning to explain the whole devolvement nor address the remnants of Pagan culture. For that look to Carlo Ginzburg as a starting place. The book has great notes, a reasonable bibliography and index, and three appendixes. At 200 pages, it is a great short look at a specific time and place. This entry was posted in Book Review and tagged Medieval History. Bookmark the permalink.